Well it’s that time of year again, the count down to Christmas. It seems like the decorations go up earlier and earlier. The Holiday frenzy! Shop, shop and shop till you drop. Buy, buy and buy some more. Sales, sales and more sales. My head spins when I hear and see the commercials on TV about the great deals you can get. I know this is the time of year where retailers make there money but really it’s like people on a shopping high, like there on crack cocaine with shopping madness. Most of the stuff we don’t need, don’t really want and can’t really afford. People are putting themselves in debt over the idea that we must buy gifts for others to either look good or feel that that is expected of them. How about a Christmas of hope, faith, love and joy with simple gifts. Gifts from the heart. All the other stuff can wait. There always will be another sale. 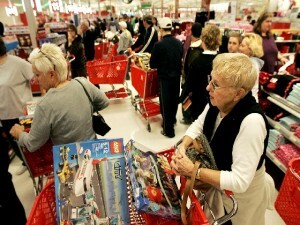 Christmas is not one big sale, and rushing to the mall to shop! It is about finding your joy and inner peace within your heart and sharing yourself, your true authentic self with others. Christmas is about spirit, hope and forgiveness. So if you are participating in the holiday shopping madness, please just remember to bless the person waiting on line behind you and in front of you. Bless your neighbors, and all those people you come in contact with on a daily basis. That truly is the Christmas spirit. Amen! This entry was posted on Tuesday, November 29th, 2011 at 10:40 pm and is filed under Art of Thinking. You can follow any responses to this entry through the RSS 2.0 feed. You can leave a response, or trackback from your own site.